This is our second post in our series about protection dog training. Now I want to reiterate that protection training is not the same as police dog training and I wouldn’t call it attack dog training either. Protection training is training your dog to protect you and your family when and if the need ever arises. In all honesty I hope that you are never in that situation. One of the fundamental traits we want in a protection dog is prey drive, which was covered in a previous post here. Another drive that we want to see is defensive drive. This is the dog’s drive to protect itself from a perceived threat. This is not a comfortable place for the dog to be in, but necessary for solid police work, protection work, and Schutzhund trials. When a dog is in defense drive they are in a position where they feel they are being threatened or attacked and as a result they are under a lot of stress. What we look for when testing for defensive drive is a dog that will act aggressively towards a perceived threat. It’s basic fight or flight instinct and we want to see them stand and fight rather than cower and run. 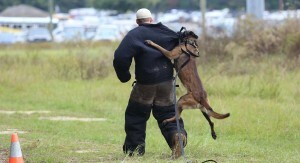 This is a make or break trait for a protection dog, and it cannot be trained into them. It is in their genes. Good examples of dogs that don’t really possess the inherited defensive drive gene are: Golden Retrievers, Labs, Huskies, and other like breeds. Not to say they won’t show aggression towards a stranger or threat but when it comes down to it they are much more likely to tuck tail and run than stand and fight. Most dogs won’t show the defensive drive until they reach puberty or about 1 year of age. But this drive doesn’t fully develop until the dog reaches full maturity which can be as late as 3 years old. When training protection we try to work the dogs in defensive drive only occasionally because of the stress it does put on the dog. We want to utilize this drive in protection work not beat the dog down with it. Contact us for more information on defensive drives in protection dogs, and if you are interested in training a protection dog for yourself give us a call we will be very happy to help you out and test your dog if you’ve already got him.